We’re speaking today with Talking Head, who played D1 volleyball and has coached the sport for many years, about how things are stacking up in the Big Ten this season, and his thoughts on Penn State and some of the other leading contenders. DigNittany: Penn State, surprisingly to some, is sitting in second place in the Big Ten race, but has a very tough second-half of their schedule coming up. Minnesota has impressed a lot of people as having separated themselves from the rest of the league — not only in the standings (up by two matches at present) but also in the quality and consistency of their play. 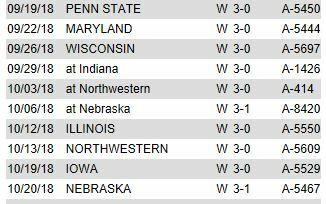 Some fans are chortling about Nebraska, which has lost four of its last five matches, but the Huskers might very well win their final 10 matches (including one against Penn State in Lincoln on November 2nd). Wisconsin sometimes looks really good and sometimes not-so really good, and the same could probably be said about Illinois, Michigan and Purdue (and Penn State). Your thoughts? Talking Head: Let’s start with the Gophers, who I think are going to end up as champions in the B1G. Minnesota took care of business in their first 10 matches and played pretty clean — only losing two sets to B1G opponents so far. They really haven’t been tested (other than the Nebraska match on Saturday, but still a 3-1 win). They arguably have had a favorable schedule because they’ve been home quite a bit, but they’re on the road for seven out of their next 10 (including Michigan, Wisconsin and Penn State). I think they may lose one or two matches — I don’t think they’ll lose three. So they have to be favored. The team that I think could catch them (and not meaning any disrespect to Penn State or any other team) is Illinois. Talking Head: First off, Illinois is a very good team. 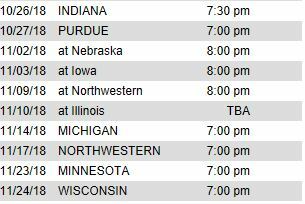 And secondly, they have a really favorable schedule coming up. They have a couple of tough ones, but never back-to-back tough ones (and they play Penn State at Illinois). DigNittany: What about Penn State? Talking Head: Penn State is going to have a tough go of it. They’re a good team that had a good first half, but has a very tough 2nd half of the season (playing six of the top seven teams). 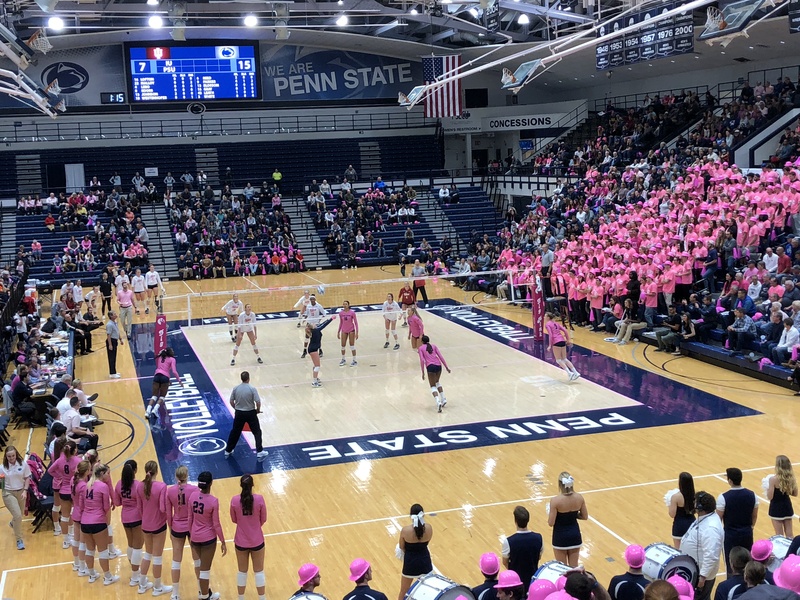 But in a way, having to run that gauntlet of five final matches at the end of the regular season — four of them against top-seven B1G teams — really is a beautiful thing for Penn State. 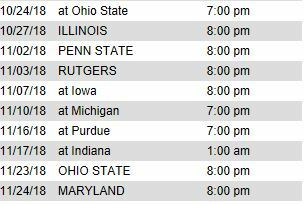 Sure, you want to win all of your matches, but you also want to play against good teams — and with Illinois, Michigan, Minnesota and Wisconsin (with Northwestern wedged in there in the middle) Penn State will be playing really good teams to finish the regular season. That’s a great schedule that should generate some interest, generate some enthusiasm, and really put the team to the test. That will be good for them. DigNittany: Your thoughts on Nebraska? Talking Head: Nebraska has run into a rough patch (losing four of five), but in their next 10 matches, they only play four of the top seven teams — with Illinois and Penn State being home matches. 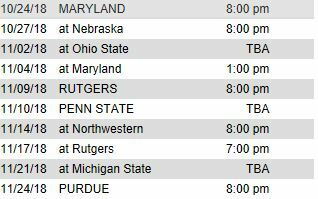 I think Nebraska will go 8-2 in those matches, at worst, and that will almost guarantee them a seed in the tournament, though they aren’t going to host. 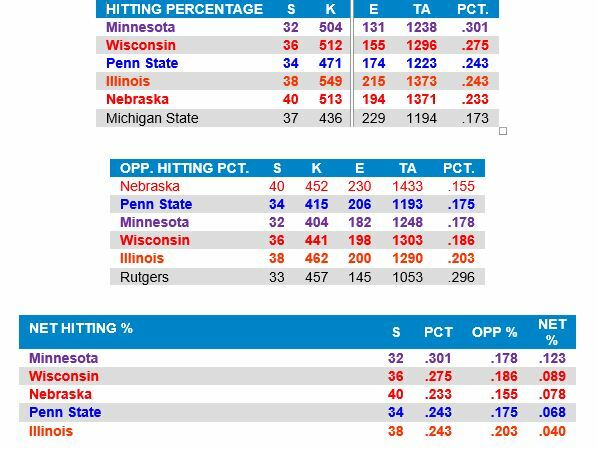 DigNittany: Looking at the B1G’s Conference-only team stats, Penn State is performing pretty well. Talking Head: It’s nice to see Penn State right up there in hitting and blocking in what’s something of a rebuilding year. Even though Penn State isn’t the offensive juggernaut it has been in previous years [in 2009, Penn State averaged .381 as a team! 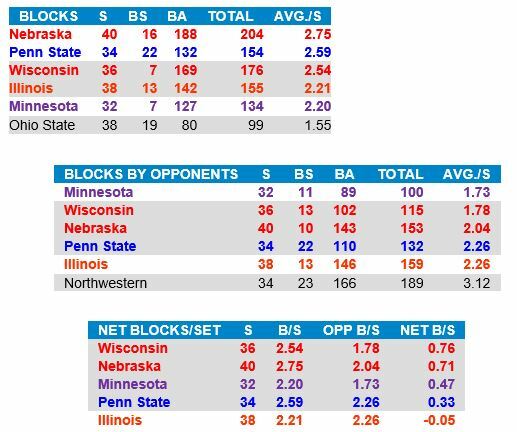 https://www.dignittanyvolleyball.com/psu-stats/; in 2014, Penn State averaged .342 as a team! https://www.dignittanyvolleyball.com/36246-2/ ] they’re still making teams perform below their standard. DigNittany: Coach Rose gave Bryanna Weiskircher some praise in his press availability on Tuesday (saying he thought she’s been playing “really well.”) Your thoughts on the top setters in the B1G this season? Talking Head: The premier setters are leading the way. You’ve got Seliger-Swenson, you’ve got Poulter and Hilley, and Bryanna is right up there with them and doing a really good job with a bunch of freshmen behind her. And that’s a great testament to her skillset and leadership. When you throw in her defense and toughness at the service line, Bryanna is more than holding her own. I think Jenna [Hampton] plays really hard and that’s what I saw when I recruited her. There are some certain things that she can pick up from Kendall [White], because Kendall plays really hard. I think the two of them playing together provides us with three rotations where our defense is really strong. It also helps when Gabby [Blossom] goes in, because I think Gabby is another one who plays really hard defensively. Gabby came in against Rutgers and served an ace on game point in the deuce game. All of the players have opportunities to go in and play. This past weekend a couple kids were sick and dinged up and that was the reason why they didn’t get a chance to come in and play. Talking Head: That defensive core — and I have to include setter Bryanna Weiskircher in that group as well, along with OH Taylor Leath, and the other DS substitutes they bring in like Emily Sciorra, and Bayleigh Hoffman, and Kristin Krause — that group is keeping balls up and keeping balls in play. I think one thing Penn State does really, really well is handle the second ball. I think there are five, six, seven kids who are seeing playing time who have absolutely no hesitation about handling the second ball, and they all set a really good, hittable ball. You can’t say that about too many Big Ten teams right now. DigNittany: Any predictions for the rest of the season? Talking Head: I think Penn State wins their next two matches. I think they are getting better, and they seem to be getting better exponentially. And that should give some Big Ten teams pause. That having been said, I do say “Watch out for Illinois.” I think having kids like Poulter — she’s a gamer — and Bastianelli, they could give any team trouble. I think Wisconsin could falter a little bit, although they are very talented, and I wouldn’t be surprised if Nebraska gets a loss or two hung on them. Their freshman setter, Nicklin Hames, is good, but she’s no Kelly Hunter — at least not yet. Hunter did the talking, she backed it up with her performances, and everyone else just jumped on her shoulders. The Huskers miss Kelly Hunter. DigNittany: Thanks so much for your time. We appreciate it.